Master of Wine Rod Smith has tasted wines that crossed the Atlantic and back and although perfectly fine, they were noticeably more mature and forward than bottles of the same vintage that stayed put on terra firma. This needs bearing in mind when stocking older vintages of Bordeaux, Burgundy and port for trips of any great length. But that shouldn’t put you off storing wine onboard your yacht; get the wine right and you can be sure of a magical time. 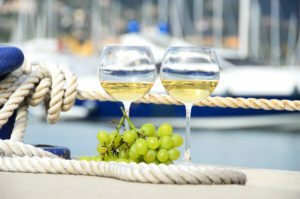 There are a number of first-rate suppliers of wines and spirits to superyachts. Penum is a brand-new London-based company that recently supplied £1 million of wine to a superyacht client. It specialises in sourcing fine and rare vintages and offers a wine-matching service too, allowing you to select wines to go with particular dishes or to follow regional themes. Vins Sans Frontières is a Nice-based company that not only sources fine wines from elsewhere but also holds a vast stock of wine itself, ideal for instant provisioning. Chief consultant Rod Smith is also a qualified WSET educator and runs wine courses at the Riviera Wine Academy. Many people choose not to take their finest wine on board for fear of it coming to harm, explains Matthew Chatt-Collins, head of yacht design at Andrew Winch Designs. One owner I speak to confirms this. He has been collecting wine for over 25 years and has some 1,000 cases in his cellar. He explains that he wouldn’t risk shipping them to his yacht for fear that the cases would travel in a lorry whose air-conditioning failed or would end up sitting on a baking hot Mediterranean quayside. This article was originally posted on BoatInternational.com.